From left: Alan Cooke, Larry DiMatteo and Sonia Singh. 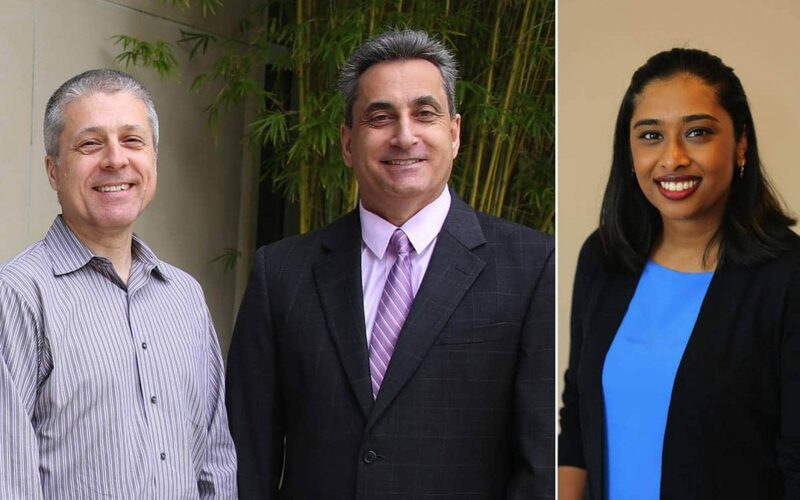 GAINESVILLE, Fla. – The University of Florida Warrington College of Business recognized faculty members Alan Cooke, Sonia Singh and Larry DiMatteo as its 2018-2019 Teaching Award winners. Cooke and Singh are the recipients of the Undergraduate Teaching Award, and DiMatteo is the recipient of the Gradate Teaching Award. Alan Cooke: Cooke is an Associate Professor of Marketing of the Marketing Department at the Warrington College of Business, University of Florida, where he has taught since 1997. He received his Ph.D. in cognitive psychology and M.S. in marketing from UC Berkeley and his B.S. in engineering psychology from Tufts University. He has taught in the undergraduate, traditional and executive MBA, and Ph.D. programs in classes focused on marketing principles and customer analytics. His research focuses on consumer decision making, particularly the role of context and comparison processes on preference. His research has been published in academic journals such as the Journal of Consumer Research, Journal of Marketing Research, and Journal of Experimental Psychology. In his free time, he enjoys running, hiking, computer programming and spending time with his family. Sonia Singh: Singh is a Lecturer at the Fisher School of Accounting. She received her LL.M. in Taxation, J.D., M.Acc. and B.S. in accounting all from the University of Florida. She teaches various graduate and undergraduate accounting courses, including intermediate and advanced accounting. Singh also teaches accounting in the UF MBA Online program. Her research interests include financial accounting and taxation. In 2018, she received the Michael Cook Teaching Award from the Fisher School of Accounting and the 2011-2012 Accounting Faculty of the Year award from the Warrington College of Business. At the Fisher School, Singh is the faculty advisor for Beta Alpha Psi, the accounting honor society. She is also a licensed CPA and attorney in Florida. Larry DiMatteo: DiMatteo is Huber Hurst Professor of Contract Law & Legal Studies in the Department of Management as well as an affiliate professor at the University of Florida Levin College of Law. He received his J.D. from Cornell Law School; LL.M. from Harvard Law School; and Ph.D. in Business and Commercial Law from Monash University. In 2012, he was the University of Florida’s Teacher-Scholar of the Year; former Editor-in-Chief of the American Business Law Journal; 2012 Fulbright Professorship (University of Sofia); and author or co-author of 120 publications including 12 books. His books include, Smart Contracts and Blockchain technology: Role of Contract Law (ed. Cambridge University Press 2019);Chinese Contract Law: Civil and Common Law Perspectives(ed. Cambridge University Press 2017);Comparative Contract Law: British and American Perspectives (Oxford University Press 2016) (M. Hogg); International Sales Law: Principles, Contracts and Practice(Beck, Hart, & Nomos 2016) (Janssen, Schulze & Magnus); Global Challenge of International Sales Law(ed. Cambridge University Press 2014). Professor DiMatteo has been a Visiting Professor at University of Münster; Bocconi University; University of Catania; University of Leicester; University of Warsaw; City University Hong Kong; University of Torino, Jagellionian University, University of Bologna, National State University Mohyla Academy (Ukraine), among others.